Unitech MS926 is a new generation of wireless 2D pocket scanner that doubles the excellent decoding performance in a pocket-sized enclosure. 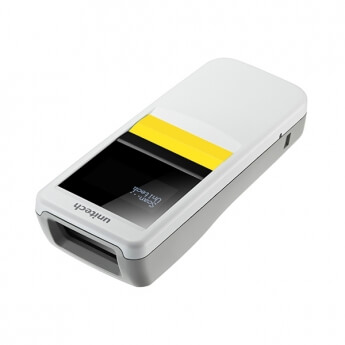 Thanks to its 1-inch OLED display & lightweight design for easy mobility, MS926 allows enterprises to simply scan and transmit 1D or 2D barcode and check feedback of the scanned information in real time. Designed specifically for mobile users and business professionals, the MS926 is a lightweight stylish design that slips easily into the average-sized pocket. Featuring superior 2D scanning design, MS926 ensures read reliability for the LCD screens of mobile devices and paper in any orientation. The MS926 offers a user-friendly experience with three-button operation that is very easy to use, requiring no special training. Built-in a bright 1-inch OLED display, mobile workers can get feedback of the scanned information in real-time. This device also delivers Smart Data Mapping Technology which is combined Lookup Table and Data View/Edit Function with Date / Time stamp. It helps users to ensure data transmitted correctly and it is allowed to check up to 10,000 pre-load barcodes in the memory of Lookup Table that is more flexibility to correct data and tracking scanning schedule immediately. Moreover, MS926 is built in 2MB Flash ROM for up to 100,000 barcodes storage in batch mode (depends on barcode length). The MS926 not only incorporates rugged design with an IP42 environmental sealing against moisture and dust, while also surviving a 1.5M drop to concrete, but also it provides the convenience of wireless technology which makes barcode data collection simple, reliable for all users. With NFC-BT automatic pairing function, MS926 can connect quickly and easily to the NFC enabled device without complex setting, it helps users to improve efficiency in mobile work place and delivers the flexibility with the 10 meters operating range.